The new year is officially here. For many, this means creating lists of resolutions with intentions of modifying one’s behavior. In honor of this tradition, my sidekick, Poncho, and I have decided to join in, talking about resolutions to help dogs stay in their homes and out of animal shelters. We encourage you to team up with us and add the dogs of your community — whether your own or someone else’s — to your list of personal achievements. According to a study conducted by the National Council on Pet Population Study and Policy on Reasons for Relinquishment of Companion Animals in U.S. 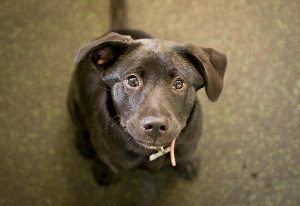 Animal Shelters, the top reasons dogs are sent to shelters have to do with living situations, cost, time, owners having personal problems and behavioral concerns of the dogs themselves. 5 – 4 – 3 – 2 – Wow! Welcome to 2012! As an inquisitive canine who knows a lot about human behavior, I’ve learned that many of you bi-pedals start the new year with a list of self-improvement goals for the next twelve months. I thought it would be the perfect time to jump on this little bandwagon, explore a few of the more common commitments found on these resolution lists, and apply them to life with a dog. Get Fit: Looking for ways to stay in shape or lose a little holiday weight? What about your dog’s weight? Is he or she more on the curvy side? How about their endurance? If either or both are an issue, or if you just want to maintain your current condition, the new year is an ideal time to start fresh, don some new athletic shoes and begin an exercise program. You will find no better or more enthusiastic training partner than your dog. Walking, jogging, running, hiking, playing hide ‘n’ seek, attending a dog training class or joining a canine sport group, such as agility or Flyball, are all known to boost physical and mental health – for humans and canines alike! Several years ago, I brought a new puppy into the family “to keep my older dog company.” That backfired because they fought constantly. The older one passed away a few years ago, but now I’d love to add another dog to my family. What is the best way to introduce a new dog into a family with another dog while avoiding what happened the last time? 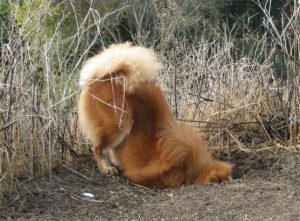 Geez, I hate when setting up a mutt-match backfires. As you’ve learned, arranging relationships between two or more dogs living in the same home takes more than just pointing to the cutest nearby pooch or making the decision based on who you think your dog would like. If you or someone you know intends on spending the pawliday season giving or receiving the gift of a puppy or adult dog, then yippee and woohoo! As a dog mom, I know how meaningful the human-animal bond is. I’m truly thankful each and day for the relationship my sidekick (Poncho) and I have. Speaking as a certified professional dog trainer, I can attest that being proactive and planning ahead before bringing a new puppy or adult dog (or any pet, for that matter) into your home, can help ease the transition and reduce stress — for everyone, including the dog. So for those who are in pet-parent-to-be mode, we’re here to assist you in making the transition a little easier by providing a few simple tips to help start you out on the right paw. Health and Wellness: Similar to human health practices, prevention is key! So we encourage you to schedule a wellness exam for your dog, to be sure he or she has been evaluated, and is receiving all they need to maintain good health. This goes double if you have zero health history about your dog. If you feel your dog doesn’t need a full exam, ask if you can bring your dog in just to say hi, meet the staff and get a treat. This will leave a nice impression the next time your dog has an appointment (FYI, this goes for any dog, not just newbies). The Right Resources: If you’re in the market for a groomer, dog training services, dog walker, petsitter or daycare facility, you’ll want to start investigating for names and places sooner than later. For day-to-day needs, look to local pet supply stores, garage sales, thrift stores, friends cleaning out their garages (checking expiration dates on products) and, of course, the Internet. When hiring someone who provides such services, an Internet search, along with word of mouth from friends and neighbors, is a great way to begin your hunt. As for those you’d hire, we feel interviewing two or three is a sensible approach. If possible, have your dog meet each provider as well, since your dog is the one who’ll be spending the most time with the person. Start with the Basics. There are thousands of pet products on the market nowadays. For sure you’ll need a collar with ID, as well as food, water bowl and leash. Depending where you live, a license might be required as well. Check with your county animal services department. Microchips are optional, but quite handy; ask your vet for information regarding the insertion of a chip. If your dog came with a chip, the facility or person you got your dog from should be able to provide you with what you’ll need in order to update the contact information. 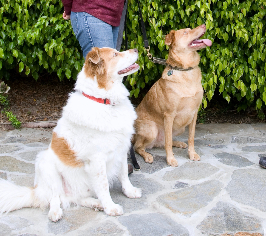 Neighborhood walks for fun and to show your dog his or her new neighborhood. Until your dog learns to stay with you and has a good recall, staying on leash is highly recommended. (Plus, it might be the law). Bring along treats to reward behaviors you like, and when introducing your dog to new people and other dogs. Field trips to places you frequent. Many dogs love car rides and running errands. Make sure your dog is kept safe while going for rides. Seat belts and car seats are easy to find, inexpensive and help protect your dog from injury. Meet-and-greets with friends and neighbors. Allow your dog to set the pace as to how quickly he or she wants to socialize. It might be overwhelming with all the new changes, so be patient. Dog training classes. No matter your dog’s age or skill level, classes with emphasis on manners or sports are enjoyable activities for having fun, learning new skills and enhancing your bond. Yard play. Playing games in your own home and yard — fetch, tug, hide ‘n’ seek, scavenger hunts or just chillin’ with each other and giving belly rubs — is quality time and enjoyable for everyone, and often the best part of the day. Huddle Up: No matter how many people will be caring for your dog, delegate responsibilities and how they’ll fit into your current schedule. Feeding, walking and exercise, potty outings, clean-up, vet appointments, grooming and training are just a few general responsibilities that make up your dog’s daily agenda. Make sure everyone knows the routine, his or her list of duties and that maintaining consistency is essential to your dog adapting and learning what you want. Environmental Management: No matter the age of your new dog, he or she will need to learn about, and settle in to, your environment. 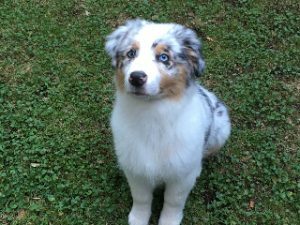 Puppies will require additional guidance on house-training, which includes rewarding desired behavior, tighter management and observation. Older dogs still need to be taught where the bathroom is, and get rewarded for using it. For a step-by-step plan on how you can house-train your dog, check out our free eBook. Puppy- and dog -proofing your home will also set your dog up for making better choices. Take the time to section off off-limits areas, safely putting away those things you don’t want your dog to get to (lead your dog not into temptation, and not into danger). As you learn more about each other, you can slowly increase your dog’s boundaries, allowing more freedom. Sleeping arrangements: You’ll need to decide where your dog is and isn’t allowed to sleep. Will your dog slumber in his or her own bed? Crate? Your bed? Floor? Couch? There’s no right or wrong answer. Just make sure you’ve approved it, it’s safe and you’re able to monitor your pooch — at least initially, until you know his or her sleeping patterns. Pet siblings: If this is a second dog or second pet, you’ll need to take the necessary steps to introduce your new dog to the seasoned residents. Allow each of them to set the pace on how fast they want to establish a relationship. Keep the vibe positive and easygoing, while at the same time safe. Read more tips on introducing a new dog to a resident dog. Tracking down resources, gathering supplies, delegating responsibilities and establishing a dog-friendly environment are key components in setting you and your new canine companion up for success. We encourage new pooch parents to begin developing a plan of action to help your dog feel welcomed!. By doing this, you’ll make the adjustment easy on everyone, which leaves more time for fun and games (and belly rubs). On behalf of Poncho, myself and The Inquisitive Canine, we wish you and your family a joyous and pawsitively reinforcing holiday season. Your readership is the ultimate gift, and we thank you for being part of our family. (Want to see the official Mayer Family holiday photo? Check out our Inquisitive Canine Facebook page where we’ll be unveiling it mid-December). Dear Inquisitive Canine is written by Joan Mayer and her trusty sidekick, Poncho. 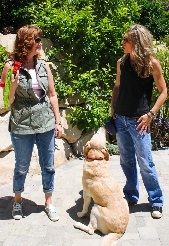 Joan is a certified professional dog trainer and human-canine relationship coach. Poncho is a 10-pound mutt that knows a lot about human and canine behavior. 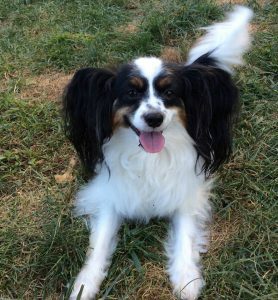 Their column is known for its simple, common-sense approach to dog training and behavior, as well as its entertaining insight into implementing proven techniques that reward both owner and dog. 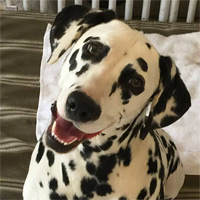 Joan is also the founder of the Inquisitive Canine, and developer of the Out of the Box Dog Training Game, which highlights her love-of-dog training approach and the importance of understanding canine behavior. If you or your dog has questions about behavior, training or life with each other, please email them directly.